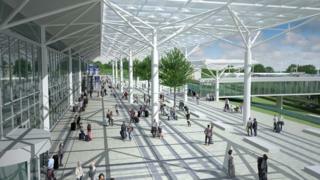 Bristol Airport has submitted plans to increase its capacity by 30%. Airport bosses want up to 12 million passengers a year to use Bristol by the mid-2020s and said operational changes were needed to cope with the demand. The proposals include a multi-storey car park and expanded baggage handling areas but plans for a new terminal have been shelved. Neighbouring parish councils have said the local roads cannot cope with any increase. The proposals follow a consultation earlier this year. The airport - used by 8.5 million passengers this year - has asked North Somerset Council for permission for a development that would see the existing terminal enlarged, a bus and coach station created on the roof and an extension to the Silver Zone long-stay car park. It has also requested a change to the seasonal restrictions on night flights so there is an annual cap on movements instead. The idea would be that, by 2026, the airport would run an additional four flights a night during the peak summer season. The proposals also include a new pedestrianised canopy in front of the terminal with a loop road for taxis and improved access to the runway for aircraft. To counteract the impact on local traffic, changes are suggested to the A38 junctions with West Lane and Downside Road. Dave Lees, chief executive officer at the airport, said the plans set out a sustainable vision for development over the next decade and would create more than 1,000 new jobs. "These plans are a practical step to ensuring we continue to connect our region to the world, providing a gateway for business, investment and tourists," he said. "At the same time, we have sought to minimise and mitigate any impacts on the local community and environment, building on our track record of investment in surface access improvements. "They will help deliver more routes, destinations and jobs." The airport is not served by trains and is eight miles from the city's main railway station Bristol Temple Meads. With most passengers arriving by road, a spokeswoman for Cleeve Parish Council said local residents were worried any expansion would worsen traffic problems in the village. "We already have problems with airport users parking here to avoid costs so any expansion would affect that. "The airport has been keeping us informed and we do welcome the idea of a multi-storey car park but ideally they need to put in a tramway or train line to take the pressure off the local roads."